Opis: Milton Areopagitica - Hales John W.
Of the circumstances under which the Areopagitica was written, Milton has himself given an account in his Second defence of the People of England (Defensio Secunda pro Populo Anglicano contra infamem libellum anonymum cui titulus Regii Sanguinis Clamor ad Calum adversus Parricidas Anglicanos). In that work, to refute fully the calumnies heaped on his name by his enemy, he gives a rapid sketch of his past life. After speaking of his earlier days, he mentions his travels abroad, and then how, coming home, he was drawn into the great struggle that he found prevailing, or beginning to prevail. 'Then pursuing my former route through France I returned to my native country, after an absence of one year and about three months, at the time when Charles, having broken the peace, was renewing what is called the episcopal war with the Scots, in which the Royalists being routed in the first encounter, and the English being universally and justly disaffected, the necessity of his affairs at last obliged him to convene a parliament. As soon as I was able I hired a spacious house in the city, for myself and my books; where I again, with rapture, resumed my literary pursuits, and where I calmly awaited the issue of the contest, which I trusted to the wise conduct of Providence, and to the courage of the people. The vigour of the Parliament had begun to humble the pride of the bishops. As long as the liberty of speech was no longer subject to control, all mouths began to be opened against the bishops. They said that it was unjust that they alone should differ from the model of other Reformed Churches; that the government of the Church should be according to the pattern of other churches, and particularly the word of God. This awakened all my attention and my zeal. 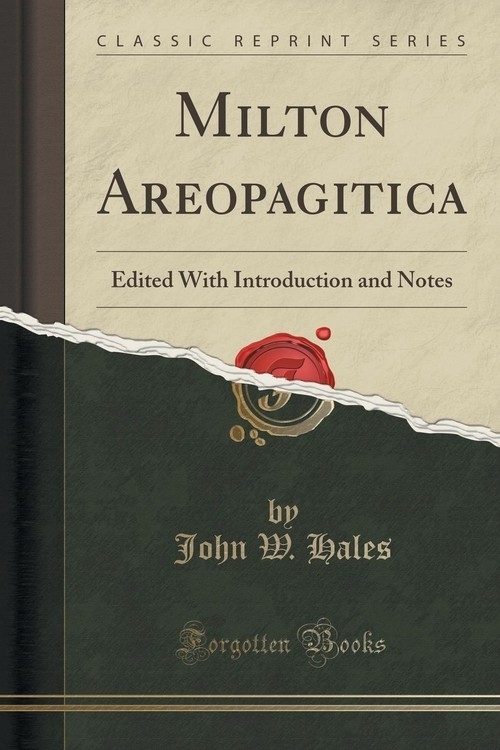 Szczegóły: Milton Areopagitica - Hales John W.
Recenzje: Milton Areopagitica - Hales John W.